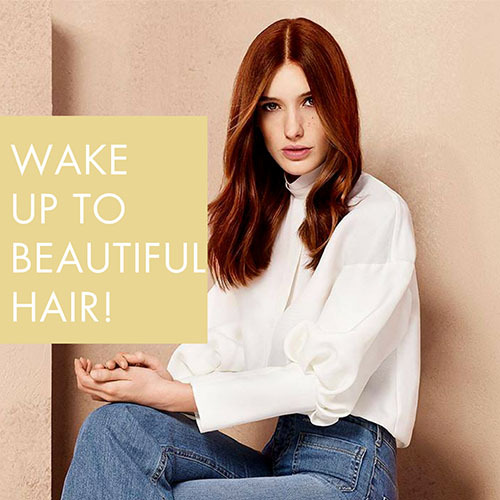 Wake Up To Beautiful Hair! Let’s face it: We’ve all dealt with our fair share of unwanted static, creases, and all-around messiness. Upon waking, it’s all about ensuring hair looks presentable enough to be out in public, a process which can be time-consuming to say the least. But what if we told you that with a little prep prior to shut-eye, you can skip all that time dealing with tangles and knots and spend more time perfecting your style? 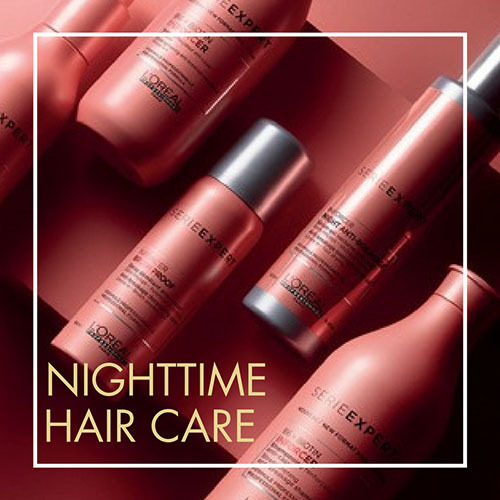 Expert hairdresser, and L’Oreal Professionnel Artist, Jill Engelsen shares her top tips on how to care for your mane at night so you can wake up to gorgeous-looking hair AND a more streamlined morning routine. Win-win! “The evening is a great time to do an overnight mask for your hair,” Engelsen says. “These products can replenish the moisture and add any reparative properties that the hair needs.” Engelsen has a soft spot for L’Oreal Professionnel Absolute Repair Lipidium. For a superlight night serum, try our new L’Oreal Professionnel Inforcer Night Anti-Breakage Serum that detangles, protects and strengthens overnight. There’s no denying that sleeping with hair that’s down can lead to quite the knotty mess upon waking, especially if the strands are long. Tie them back so they’re out of your way, but do it right! “If you have long hair, I recommend twisting the hair up into a loose topknot and securing it with a fabric-covered elastic,” Engelsen says. “This technique gives the hair volume in the AM and protects curls and professional blowouts.” If your hair is long due to extensions, Engelsen recommends pulling your hair back into a low braided ponytail. Don’t want to wake up to a voluminous mane? No problem. “If you want to decrease the volume, wrap your hair flat to your head and tie it with a silk scarf,” Engelsen says. To brush or not to brush? That is the question. “I personally don’t brush my hair very often,” Engelsen says. “I like the natural beachy texture it has when I wake up.” (In case you’re wondering, Engelman has long and wavy hair.) If you’re looking for a smoother finish in the a.m., use L’Oreal Professionnel Inforcer Brush Proof. Spray directly on the brush and then brush through hair for detangled and smoother hair.